Snap Map, the mapping service introduced by Snapchat a year ago, is getting a nifty addition called Map Explore, with realtime status from friends’ movements to enable you see where your friends are and where they’re going. The map-based feed idea, Map Explore integrates some conventional interface elements and notifications to bring users’ attention to items of interest that they might otherwise have missed out in the Map. Albeit, Snap Map is necessarily an opt-in option, and only recommended if you’re less concerned about privacy and don't border on security issue from creepy friends on the platform. While Snapchat is still getting over its redesign hurdle, the company has devoted more resources to build out the Map service, which is definitely a necessary move. 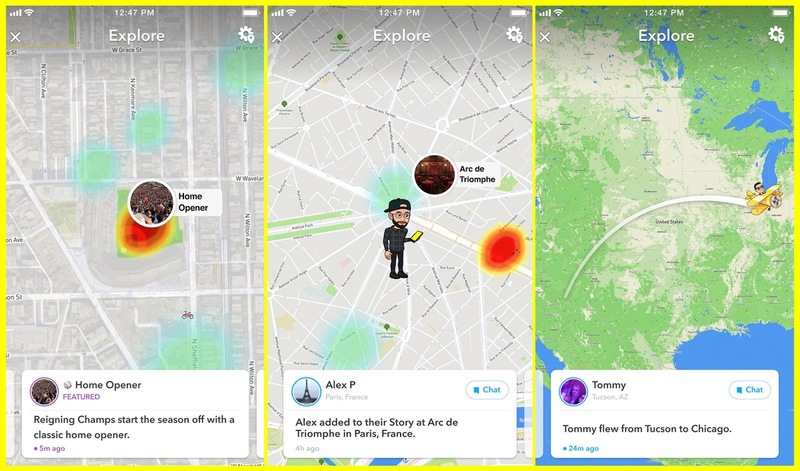 Snapchat stated that they’ll be using the feature to push updates on breaking news to users based on areas of the Snap Map that are seeing a lot of traffic tied to news events. And the feed can give updates on the habits of friends who are going on trips; also their location updates when they’re off to noteworthy spot. Snap Map also has a collaborative “Our Story” section, that collects snaps taken at a particular location that’s popular. The Map feature initially tied to privacy concerns, but you can delete your status or turn on Ghost Mode (which hides your location) by tapping on the settings icon in the top right hand of the map. The new feed feature will be rolling out globally in the next few weeks, Snap says the travel and location updates will automatically appear on users’ Snap Maps.